This is a 1/12 scale miniature kit by Jean Day. 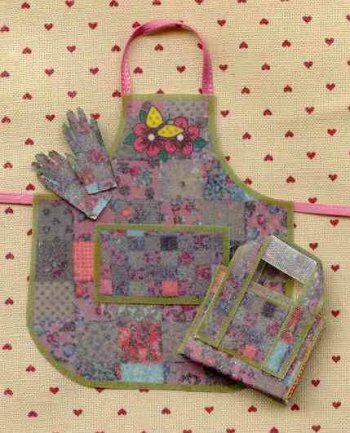 It includes the apron, bag and garden gloves.The apron can be hung or draped if the back is coated with glue and shaped on plastic or it can be worn on a miniature lady. It could also be a sewing project in a sewing room. All you need to complete this kit is scissors, glue and a toothpick.